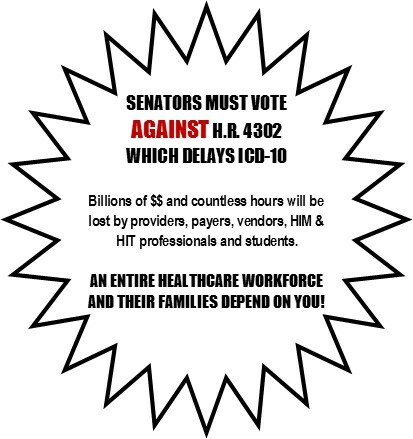 Copy this pic and email, tweet, send and share with your senators before Monday’s vote! Not sure how to reach them? AHIMA provides their phone numbers here and clicking here is a site which offers direct links to their individual websites, facebook, twitter etc. This entry was posted in Medical Billing and Coding and tagged #NODELAY, AHIMA, CMS-1500, healthcare consulting, ICD-10, ICD-9, ICD10, ICD10Watch, medical billing, Medical Billing Services, medical coding, Revenue Cycle Management, SGR. Bookmark the permalink.